This may come as no surprise to some of you, but Forrester Research just released some survey results that show that the average American now spends as much time online as they do in front of their TV! The survey, which had over 30,000 responses, also revealed that Younger Baby Boomers (between 45 and 54) are included in this group. 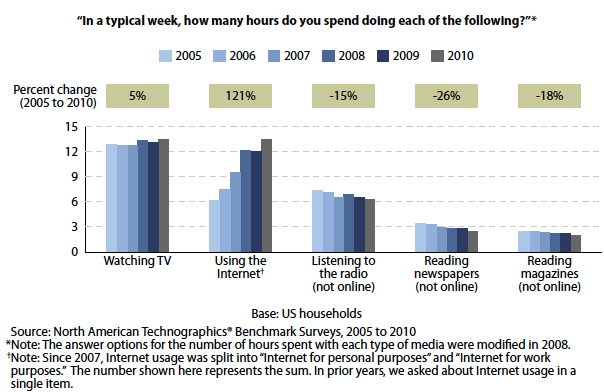 With these data, it is very hard to make the case that the web is only successful in marketing to younger demographics! As the chart above indicates, the the internet (including mobile) is the only channel that has shown notable growth in usage, with some of the traditional channels declining significantly. Small Businesses should be evaluating this data very carefully when making marketing decisions in 2011. If you need a hand developing a strategy to take advantage of the web, contact us today!